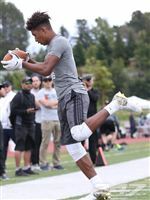 Kalef Hailassie, a fine athlete from Elk Grove, California, was a late addition to the Oregon Ducks 2018 recruiting class. He committed to Head Coach Mario Cristobal without ever meeting him, and signed with the Ducks without ever visiting the campus. An unusual scenario to say the least. 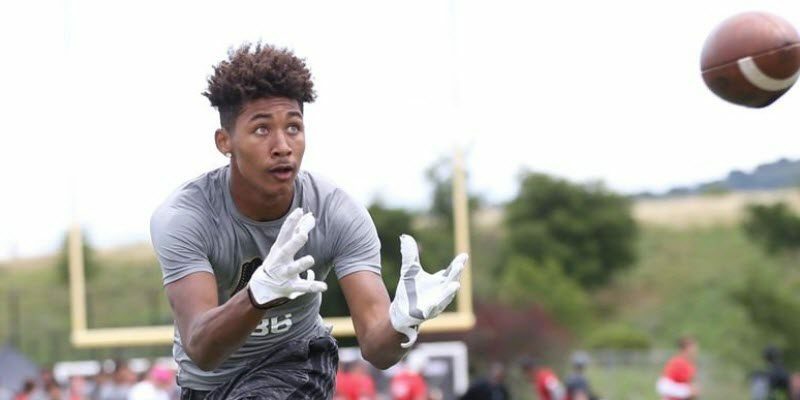 Hailassie, who was a long-time pledge to the University of Colorado, was in the midst of changing his commitment from the Buffalos to Washington State when Coach Cristobal came calling. Both Oregon Safety’s coach Keith Heyward (who had been his principal recruiter) and Hailassie’s TMP Elite coach Terrance Leonard are good friends. A phone call between Cristobal and Leonard set the stage for the offer on National Signing Day, when Hailassie switched from the Cougars to the University of Oregon. Hailassie played wide receiver and safety for Consumnes Oaks High School. Consumnes Oaks is one of five high schools in the Elk Grove Unified School District. The city of Elk Grove (population 170,000) is a suburb of Sacramento, California. According to the high school sports site MaxPreps.com, Hailassie recorded 1,262 total All-Purpose yards and 104 total tackles as a two-year starter. It appears that his senior season was cut short as he only played in about half of their games. Kalef was also a very good basketball player where he averaged over 15 points per game. Kalef Hailassie was measured at The Opening Regionals at DeAnza College on May 21, 2017. He was 6-foot-1 and one-half inches tall and weighed 179 pounds. The official Oregon Ducks football roster lists him at 6-foot-2 and 188 pounds. He did not run the 40-yard dash at The Regionals, so we do not have a official 40-clock on him from a sanctioned event. He does however, list an unofficial time of 4.6 on his Hudl.com profile. Based upon testing that he did complete, (and video observation) this time appears valid for purposes of evaluation. I have not seen any information as to his arm length or hand size, but for similar sized athletes an am length of 30-1/2″ to 32″ long, and a hand size of 8-1/2″ to 9-1/2″ is very likely. Kalef Hailassie has ideal length and athleticism to excel as a high safety. He possesses exceptional hand-eye coordination and the ability to track the ball in the air. He is pretty fluid (4.33 shuttle) and a bit of a long-strider, which accounts for his sideline-to-sideline range. He anticipates, recognizes, and reacts to plays whether they are to him or away from him. Hailassie flashes some “wiggle” on a long punt return. He demonstrates field vision and exploits the cut-back lanes. In the video above, Kalef “ragdolls” the Running Back at the Line of Scrimmage. He is a physical player that doesn’t shy away from contact. Above, Hailassie (playing on strong side), diagnoses the play and reacts to it faster than the primary defender — the high safety — when the slot receiver blocks down. Great play. Above, Hailassie breaks up a pass over the middle, tipping it into the hands of a teammate. In the video above, Kalef demonstrates excellent hand/eye coordination on a Deep Route. His tape is full of these as he flashes really fine ball skills. Above, we see Hailasse ”high point” the ball on a Seam Route, which is more difficult than a jump ball situation. Great body control as he plucks the ball out away from his frame at top speed. Hailassie lays out for the catch on a go route up field. He puts it all together: hand/eye coordination, the ability to track in space, athleticism, and strong, sticky hands. In the clip above, Kalef makes a nice one-handed catch in the corner of the endzone, with a defender draped all over him. Elite ball skills. Above, Kalef demonstrates the ability to track the ball in the air. Nice catch on the go route. He effortlessly plucks the ball out of the air. Kameron Kelly from San Diego State University. 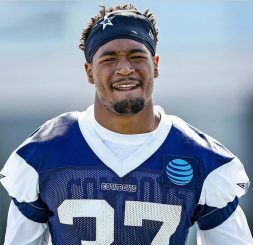 Kelly was an undrafted free agent, signed by the Dallas Cowboys in April 2018. Both Hailassie and Kelly share very similar size and athleticism. They both have a history of playing multiple positions on both sides of the ball, while they (and their coaching staffs) seek to find their best fit. The combination of a lack of elite twitch (4.33 shuttle) or top end speed (4.6) clouds their ceiling. Kalef Halassie has the size collegiate (and NFL teams) covet. He has length (6-foot-2) and is a smooth athlete. He lacks the top-end gear (4.6 range) and the twitch (4.33 shuttle) that you want to see in a cornerback. However his physicality and ball skills provide him an opportunity if need be, to play on the boundary in sub-package situations. I believe, however, that his future is at high safety. His range, build-up speed, elite ball skills, and ability to quickly diagnose plays, is a better fit rather than to go head-to-head with premier athletes out on the boundary. Hailassie should find a role in sub-packages and on special teams at Oregon. He has the potential to become a starter at the back end of the defense, later in his career for the Ducks. He is a solid football player at the collegiate level, and has some limited NFL potential.